Andrew Meirion Jones, Joshua Pollard, Michael J. Allen, Julie Gardiner. Image, Memory and Monumentality: archaeological engagements with the material world. This volume is presented in honour of Richard Bradley. 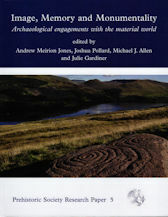 The 30 commissioned papers provide a major contribution to prehistory and cover the range of themes addressed by Richard’s own extensive research. Leading scholars discuss key themes in prehistoric archaeology that have defined Richard’s career, such as monumentality, memory, rock art, landscape, material worlds and field practice. The scope is broad, covering both Britain and Europe, and while the focus is very much on the archaeology of later prehistory, papers also address the interconnection between prehistory and historic and contemporary archaeology. The result is a rich and varied tribute to Richard’s energy and intellectual inspiration.